The folks at the Y-12 nuclear weapons plant are mighty particular when measuring quantities of bomb-grade uranium, tracking the material virtually down to the atom to make sure that even the smallest amounts aren’t lost or diverted. 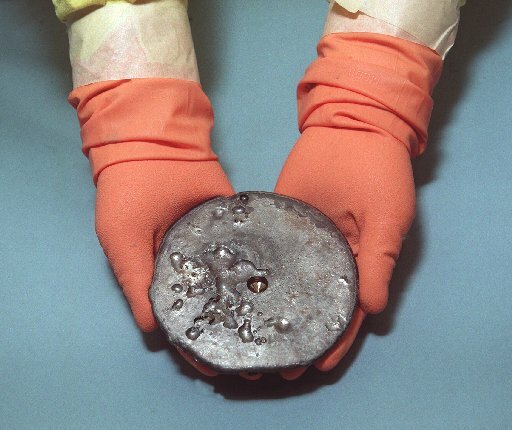 Therefore, it must have been a big surprise last month when a Y-12 engineer determined that a uranium bomb part had gained weight during a machining operation. “A process engineer discovered that the documented post-machining weight of an enriched uranium part was greater than its documented pre-machining weight,” staff members with the Defense Nuclear Facilities Safety Board stated in their April 24 report to board headquarters in Washington, D.C.
As it turned out, there was some human error involved. Members of Y-12’s Nuclear Material Control and Accountability team traced the source of the discrepancy to a “documentation error” by a worker in the plant’s 9212 uranium-processing complex. The worker reportedly logged the part’s assay (enrichment level) as the part’s weight. The board memo said the responsible production team managers at Y-12 are evaluating ways to reduce error rates and prevent a recurrence. This entry was posted in CNS, DNFSB, Y-12 on May 27, 2015 by Frank Munger.